There are regulations that govern the types of memorials that can be erected in Churchyards and Cemeteries and Stone Man can advise you on these or you can obtain this information directly from the either your vicar or local authority. The regulations will specify the type, size and materials of the memorial that is allowed. Do we have to choose a headstone straightaway? 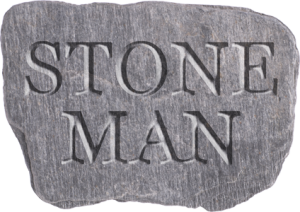 Stone Man is an independent monumental mason and member of the Guild of Master Craftsmen. It is important to remember that you are under no obligation to choose and purchase a memorial whilst making funeral arrangements, allow yourself time to seek alternative quotes. We can work with you and/or your family to choose a suitable memorial at the appropriate time thus giving you the necessary spaceto find the right design and epitaph for your loved one. Please See ‘Burials & New Memorials” for ground settlement timescales before placing a new memorial on a grave. It is recommended that a minimum of 9 months should have elapsed from a burial before a new memorial can be erected. Each churchyard/cemetery will have their own rules on this but it is important to allow for ground settlement before erecting a new headstone and foundation. Stone Man is more than happy to advise on timescales and will work with your churchyard or cemetery these are adhered to. Before any new memorial can be erected; permissions must be sort from the Cemetery or Churchyard by the grave owner. It is usual that we as your monumental mason would act on your behalf to obtain these. A fee is applicable and sketches along with inscriptions need to be approved prior to installation. There are usually set areas for Cremations within churchyards and cemeteries and there will regulations to cover the type of memorial that can be fitted. Please talk to us for advice. Please note that at Stone Man we specialise in hand carved lettering. It is important when obtaining competitive quotes for your memorial or carvings that you compare like for like. There are many different types of stone, finishes and lettering; be it hand carved, sand blasted or machine carved and all will vary in price and quality. We can talk through the options and help guide you in creating a lasting memorial within your budget. We want to create a lasting memorial and in particular we enjoy creating bespoke designs. At Stone Man we mark on and carve by hand so our customers can be involved throughout the process, if they so wish. For some, this can aid with the natural healing process in creating a memorial for a loved one; we have also found this a useful approach when working with committees for Commemorative type projects. Depending on the stone material chosen, there will be different delivery timescales. Lots of Granites are imported but there are plenty of British stones available such as Slate, Limestone, Portland or York Stone. We will advise on timescales at the initial point of enquiry. Our work is hand carved and is not rushed, we will advise on the intended date of installation but please note poor weather can hinder this. After accepting our quotation, Stone Man asks for a deposit to secure your order with the final payment due within 7 days after your memorial is fitted. Stone Man is proud to be a member of The Guild of Master Craftsmen.